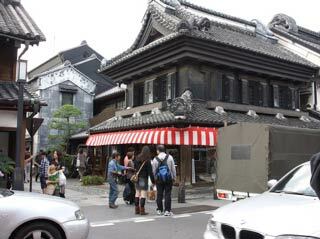 Kawagoe has many traditional buildings that offers just the scenery of Edo period in modern world. Those traditional building are called "Mise-Gura." Mise-Gura is a store converted from storage. They are also called "Kura-zukuri," literary means "a house made from Storage." In 1893, there was a huge fire disaster that burnt down the entire city. However, after the disaster, those Kura survived from the fire. After that, all merchant started used their Kura as their store because they were fireproof building. Those Kuraz-ukuri are still preserved in great condition and most of the stores are still used.The main street of Kawagoe has the largest number of Kura-zukuri in such a small area in Japan. Some of Kura-zukuri is over 200 years old. The scenery of Kura-zukuri is fair enough to consider Kawagoe as "Little Edo" even today. Use Kanetsu Express Way to north. Exit at Kawagoe. Use JR Yamanote Line to Ikebukuro. Change to Tobu Tojo Line to Kawagoe Station.